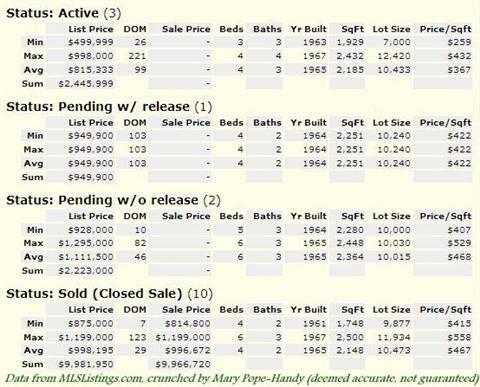 What’s happening in the real estate market in the Belwood, Belgatos and Surmont areas of east Los Gatos? Today I did some research on the MLS for 2011 year to date in this part of 95032. In the image below, after I completed my work I realized that one of the “actives” is actually on the San Jose side of Blossom Hill Road (the low price home at just under $500,000 – it is a short sale by the way). The numbers tell us that in general a 4 bed, 2 bath home in average condition (that is, partially updated but not “fully remodeled”) is worth just about $1,000,000. I find the “sum” number to be unhelpful but the minimum, maximum and average sales prices (including the cost per square foot) to be extremely useful. 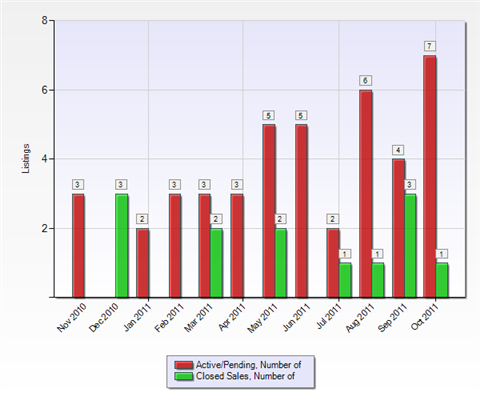 Let’s stop a moment and just look at what’s closed so far in 2011 – 10 homes – about 1 home per month on average (very, very low turnover). 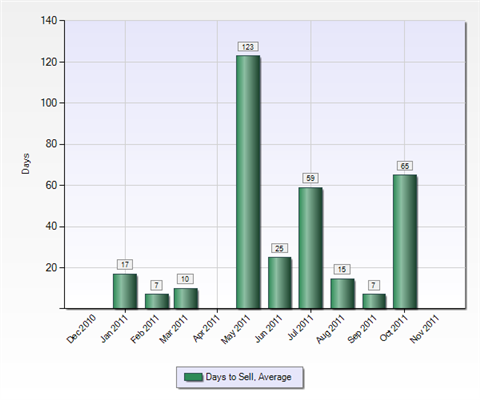 Next – how long does it take to sell these Los Gatos homes? As you can see, often there are far more homes available (or listed for sale on the MLS) than are selling. This is typical for all of Silicon Valley but of course to differing ratios. It’s a red hot seller’s market when homes are selling as fast as they’re listed. In most markets, though, some percentage of homes never does sell – it’s a bit like the “bell curve” applied to home selling. Some sell fast and for top dollar, some sell in a month or two, and some either sell only after a prolonged marketing time or not at all. With extremely low inventory and low turnover, it’s almost a crap shoot as to how fast a home in these east Los Gatos areas will sell. If there’s no other competition and the property is (1) fully remodeled and (2) priced aggressively, it will sell fast. If not, it’s anyone’s guess – but definitely worse if more homes are for sale. Want to sell your Surmont, Belgatos or Belwood home? Please contact me – I live here too and will do my best to get you the best price for your property! No homes for sale in Belwood area now! 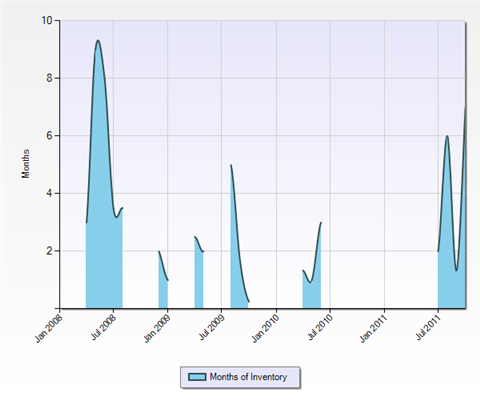 It’s mid-October and inventory is shrinking a bit. A week ago there was one home to buy and one to rent in Belwood – and none in the Surmont or Belgatos areas of the ‘hood. The available ones have been scooped up. So right now, if someone wants to live in our pretty corner of east Los Gatos, they’ll just have to wait. Many sellers are hoping that spring will bring better sales prices. If it does, that’s great for people either downsizing or leaving the area. But for move-up buyers, now might be a better time to sell one home and buy a more expensive one. Why? Prices are a bit soft now. The listing on Belblossom at $799,000 makes it clear that prices aren’t what they used to be. Buying up, the soft prices make the jump from one home to the other easier – even if you sell the current home for less. The reason is because you save more on the move-up home than you lose on the sale of the current home. The net puts you ahead of waiting ’til it’s a hot market all around. Call me if you’d like to get a current sense of value for your home. Intero does have a special “Holiday Marketing Program” that involves no sign, no open houses etc. during the slower days of December. You get far less traffic but it’s all by appointment so only serious buyers come through. It’s a great way to get the jump on the January market. Please call me on my cell at 408 204-7673 to learn more about it.